For metaphysicians who have imbibed the sober and inebriating teachings of Thomas Aquinas, existence is an act, the act which makes all things actually to be. As the act of existence makes things to be, essence makes them to be what they are. Essence and the act of existence, in other words, are really distinct yet together they compose each of the things that are.Such an understanding involves a number of paradoxes, and Frederick D. Wilhelmsen's articulation of them reveals his philosophical genius. These paradoxes include the fact that the act of existence does not exist, that it can be thought but not conceived by the mind, and that truths about God can be known while He himself remains absolutely unknown. Wilhelmsen argues the notion that the Christian faith and philosophical reason harmonize while remaining completely distinct from each other.Writing in a captivating style, Wilhelmsen begins with a discussion of the development, strengths, and limitations of the ancient Greek philosophical accounts of being. 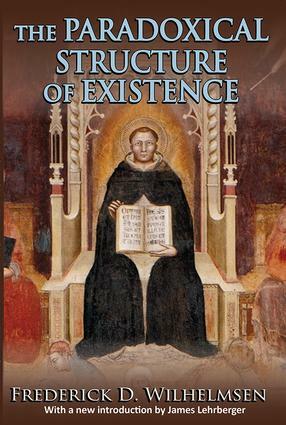 Following that, he develops such key topics as the problem of existence, St. Thomas Aquinas' understanding of being, critical analyses of Hegel's and Heidegger's doctrines of being, existence as "towards God," and a metaphysical approach to the human person. The final two chapters develop the sense in which metaphysical thinking is and is not shaped by historical and social factors.